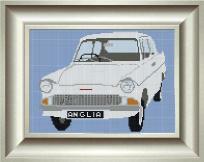 displaying images of the Ford Anglia. 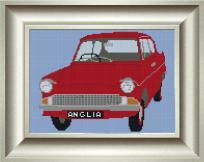 A cross stitch pattern produced by Shepherds Lodge. These kits are still available, and come in a choice of three colours. An "Embroidery design in counted cross stitch" produced by Heritage Classics Companions. 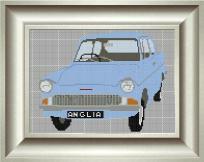 The pattern allows you to produce a fairly resonable picture of a 1966 Ford Anglia 105E. 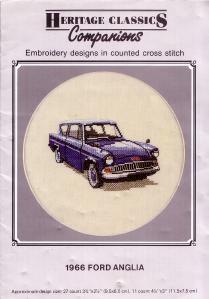 A cross stitch kit produced by B.M.Designs. The kit comes complete with :- DMC threads presorted onto organiser, 14HPI Zweigart, AIDA fabric, (Someone must know what this means) Clear Chart, Instructions and Needle.